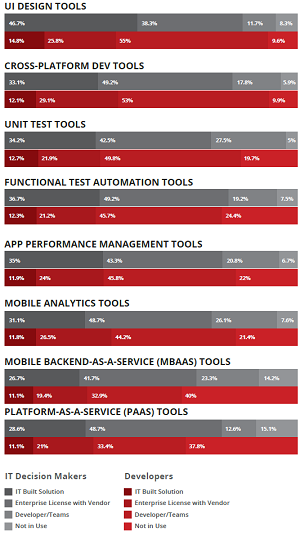 The latest mobile development survey from Appcelerator Inc. shows a "sometimes dramatic" disconnect between the realities of coders on the front lines compared with those of IT decision makers, especially concerning the areas of project ownership and tools used. 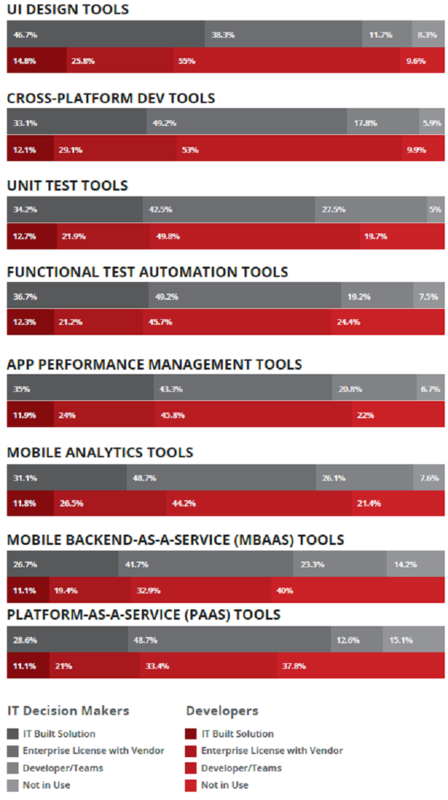 Enterprise mobility engagement and development tool company Appcelerator surveyed more than 8,000 developers and 121 IT decision makers in its Q3 2014 report, the latest of a series the company has published for years examining trends in mobile development. "A set of shared questions allowed for a direct comparison of the groups' thinking in key areas," the company said in an accompanying statement. "The results suggest a disconnect -- sometimes dramatic -- between management ideas and developer reality." One area of disagreement is the relative competitive success of enterprises in the mobile arena. "Mobile maturity is in the eye of the beholder," Appcelerator said. 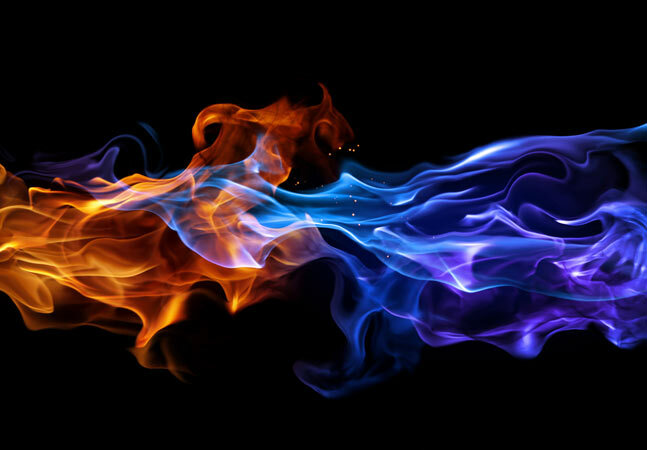 "65.3 percent of IT decision makers report their organizations to be either 'leading edge' or 'somewhat ahead' when comparing their mobile maturity to the competition, while only 34.6 percent of developers think their organizations are leading or ahead." Developers and management types also disagree on who owns the mobile agenda, with 66.9 percent of IT decision makers stating that IT is the main driver of mobile initiatives and 30.6 believing lines of business direct things. But only 34.6 percent of developers chose IT, while 49.7 percent went with line-of-business drivers. The report also found that "developers go their own way on mobile tools." "When asked who provides the range of tools necessary for mobile delivery, an average of 39.6 percent of IT decision makers say they either built the capability for their teams or signed an enterprise license with a vendor," the report stated. "But on average, a mere 17.9 percent of developers report using these tools, with the majority saying they found their own." And those tools aren't likely to be based on HTML5 Web development, if the coders have their way. "In one of the more startling separations, 70.6 percent of IT decision makers who've implemented HTML5 report a positive experience with the standard," Appcelerator said. "Among developers, that figure plummets to 37.2 percent." The two groups do agree on some things, however, and both echoed another recent report that indicated the biggest challenge in mobile delivery is finding skilled developers. Appcelerator expounded in detail about the skills shortage, which it said is not simply a matter of finding the right programming language. The real problem with the skills gap is much more complex, the company said, involving a multitude of factors such as the way apps are designed, the way connections are made to back-end data, release cadence and more. "IT departments are confronting a kind of new 'mobile culture,' one which differs at almost every point from the last generation of Web," the report said. "Developers understand this better than anyone. Companies that wait on the market to produce the necessary 'skills' will find themselves waiting a long time. But IT decision makers who understand and embrace the new mobile culture may be pleasantly surprised by the sudden abundance of willing and able developers." Both surveyed groups also agreed that projects are shipping quicker and the number of supported platforms is increasing. In fact, "adjusting to the frequency and velocity of releases" was listed as the second-highest obstacle to timely project completions, behind finding skilled resources. The most popular platforms that developers were "very interested" in targeting remained iPhone, iPad, Android phone and Android tablets, which hasn't changed much from 2010. In the only significant reordering of preferences, Google Nexus continued its rise in popularity, surpassing HTML5 for the first time. Facebook and Twitter were again listed as the top sources of public data hooking up to mobile apps, though they both lost ground compared with the Q4 2013 report. Google, Paypal and Dropbox grew more popular as public data sources. As far as the type of data source, custom Web services was listed as No. 1, showing a big uptick from the Q4 2013 report, up to 77 percent from 39 percent. The survey was conducted by research firm IDC, which polled the two groups in late August and early September.